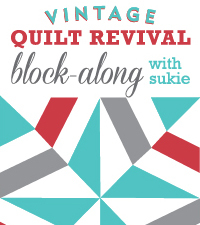 Here’s my diamond pane block from Vintage Quilt Revival . I know the colors might seem a little nonsensical at first glance, but here is what I’m aiming for. I wanted to make my quilt a little smaller than the one in the book and wanted to have a little fun with the colors. As I looked at it, I saw little fish in the quilt. Of course, you might notice that I did adapt the fish blocks to remove the center of the blocks. I’ll shift the center to the sides and bottom or top and surround the fish with the “water” of the diamond pane blocks. I wish I had a better mock-up of the quilt, but I was cutting my fabric quickly to get ready for a sewing day at my parents’ house, and apparently it was too late at night because I neglected to cut quite a few pieces. I am thinking though that I might want the fish in the center of the quilt to be larger, so I might use the diamond pane layout for it. I couldn’t fully mock it up due to my fabric cutting oversight, but what do you all think? All tiny fish (above) or 2 tiny fish with a more substantial fish thrown in there (below). And, just in case anyone out there is snowed in today again just like I am, I thought I’d throw a book recommendation out there for you. I just started reading Thunder Dog this weekend, and I’m tearing through it. It’s the story of a man who is blind and the way that he escaped from the World Trade Center on September 11th. While that part of the story itself is gripping, what I’m loving even more is the way that he talks about how he lived his entire life not thinking of blindness as a handicap; he flew a plane and rode a bike and got an MA in Physics. It’s inspiring to see his life journey, and the book is a pretty quick read, so if you need a break from quilting today, I’d suggest downloading this book to your Kindle and having a good read. ** Disclaimer: This blog is a participant in the Amazon Services LLC Associates Program, an affiliate advertising program designed to provide a means for sites to earn advertising fees by advertising and linking to Amazon.com. This entry was posted in quilting and tagged QAL, quilt, quilt alongs. Bookmark the permalink. I like it with the bigger fish in the mix. More interesting for the eye.